So far 2009 is shaping up to be a good year for Pittsburgh sports. The Steelers started off the year by winning the Super Bowl, a feat which seems like a lifetime ago, for some reason. The Pirates were above .500 for at least a few games, and now the Pens are back in the Eastern Conference Championship game. I am reminded, once again, how great it is to live in da Burgh. But things are not always rosy. A couple of months ago, I read an article in the P-G about a couple who was going through financial difficulties due to a job loss and underemployment. These two said that their mortgage was a month overdue, and the next month, the cable would go. When I read that, it kind of irritated me. I thought why would you pay your cable bill before you pay your mortgage?! A lot of good hundreds of stations are going to do you if you don't have a house to watch them in. So, not surprisingly, I contemplated writing a letter to the editor about that, thinking these people were like so many others. But I stopped myself, knowing things were slow at work and thinking it might be bad karma to do that. And, the very next day, I was told I was being let go. But now that I have been through part of a football season, including the Super Bowl, and most of hockey season, including the first two rounds of the playoffs, I can honestly say I understand what that couple was talking about! I doubt sports were the reason they kept the cable. Regardless, I will give up AC for the summer and keep my heat at 64 degrees before I give up the HD TV. Seriously. Now my next dilemma is determining if I should wear my Mark Recchi jersey or my Pen t-shirt for the next round of playoffs. 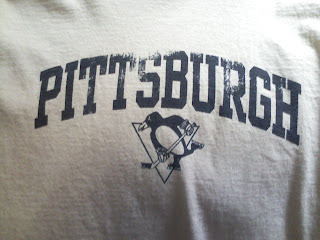 I wore the t-shirt the first two games, which the Pens lost. The Pens won 3 of the next 4, and I wore my jersey for all those games. Clearly the jersey was not foolproof! I think the bigger factor was that I watched Game 6 at my mom's, thus breaking the tradition of watching it at home. For Game 7, I was back home, but in my Pens t-shirt. I was in serious anguish about that decision, let me tell you. I will let you know how it turns out. For now, it's a great day for hockey!